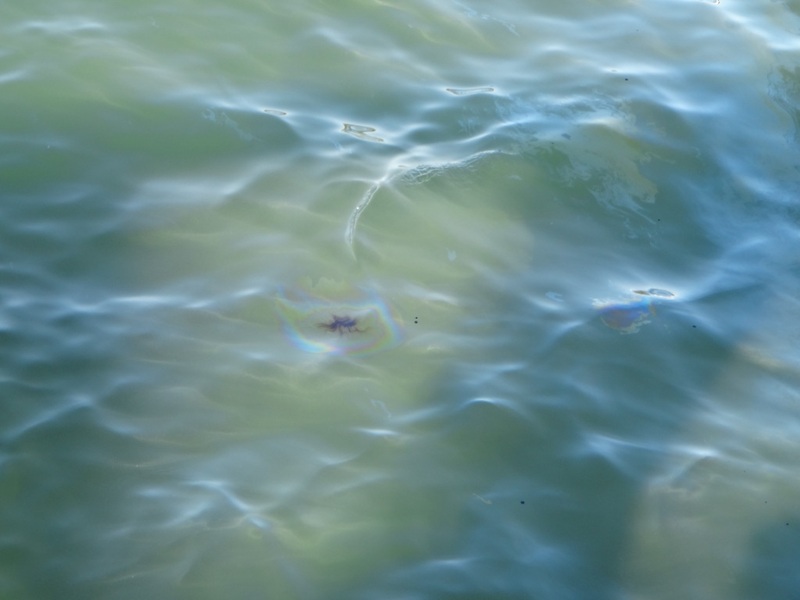 Top Photo: Oil seeping from the USS Arizona (black tears).------------------------------------- Middle Photo: USS Arizona Memorial.------------------------------------------------------------ Bottom Photo: Fort Shafter barracks.---------------------------------------------------------------------------------------------------------------------------------------------------------------------------------------------------------------------------- Today and at last we made it to Pearl Harbour. It was a 0610h pick-up and the tour bus arrived at Pearl Harbour for the first boat to the USS Arizona. It was a beautiful day and as expected the memorial was sombre. For all the movies, documentaries and other stories we have watched and heard the Arizona does lie just beneath the white covered memorial and "black tears" does rise to the surface. The ship since 1941 still leaks oil! The surrounding harbour and Ford Island is exactly what you would see from the movie Pearl Harbour. 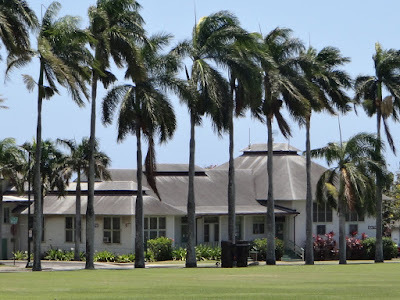 Speaking about that movie, the third picture is taken of the a pre-WW2 barracks inside Fort Shafter. For those who have seen Pearl Harbour this was the site where the hospital scene was taken - nine kilometres from the actual hospital site on Pearl Harbour. Our tour guide's name was Olav and he was very informative about the events before, during and after the Japanese raid. He was a historian and gave us an in depth picture of that day of infamy. 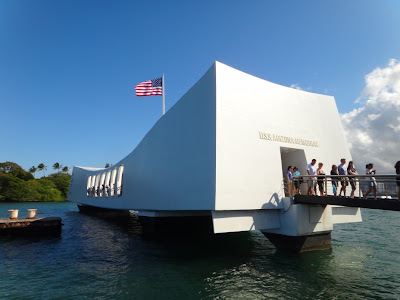 The tour went for 8 hours visiting not only Pearl Harbour but also Wheeler Army Airfield, Schofield Army Barracks, Fort Shafter and Punchbowl National Cemetery - located in an extinct volcano where thousands of US servicemen/servicewomen now lie. Because of the postponement of our tour from yesterday to today, the tour company shouted us a free lunch at Fort Shafter. Not much else to talk about however we need to have an early night tonight for a 0500h pick-up for our one-day flight to and from the Big Island. For tomoroow is a scenic volcano day, hopefully coming face-to-face with live lava instead of drinking those Duke's Bar cocktails. Cheers to all.